Coming from a young animal, lamb meat doesn't need to be marbled with fat to be exquisitely tender and delicately flavored. Perhaps lamb would be more popular if more people knew how to cook it properly. Lamb should be roasted at no more than 325ºF, or it gets tough and smells gamy. Select cuts with pink meat and white fat--red meat and yellow fat indicates an older and tougher lamb. lamb shoulder Several economical, if bony, cuts come from the shoulder. 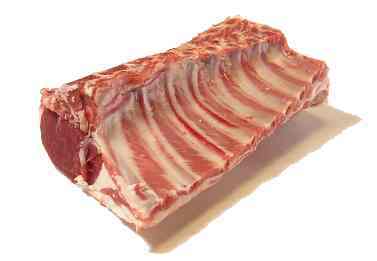 lamb ribs A full rack contains eight ribs, which are usually cut into small and tender rib chops. Left in one piece, the rack makes a delicious roast, or you can tie two or three racks together to form an elegant crown roast. lam loin This is where the most tender and expensive cuts come from, including loin chops and loin roasts. lamb leg The leg of lamb is the most popular cut. It's usually roasted, but it can be boned and butterflied for grilling. lamb breast The breast gives us spareribs, along with some other meat that's usually made into ground lamb. lamb miscellaneous cuts These come from various parts of the carcass.